We left Skagway and Alaska behind us when we followed Hwy 2 north then turned onto Hwy 8 also called Tagish Road. We had a fairly wet day for travel; we left after the White Pass train ride so it was not an early start. We made our overnight stay on the Tagish River at the Six Mile River Resort in Tagish, Yukon that night. We parked in a small grassy field with RV hook-ups, there were cabins and a restaurant and lots of things to see. We did have a delicious dinner there, and enjoyed the hosts of the resort. Click here to learn more about this great spot. The next morning was heavy fog again but the sun soon came out as we crossed the border again and traveled down to Atlin, BC. This road was originally built to be part of the Alaska Highway and takes us 94 km (58 mi) from Jakes’ Corner. The Atlin Road is partly paved with some parts gravel. 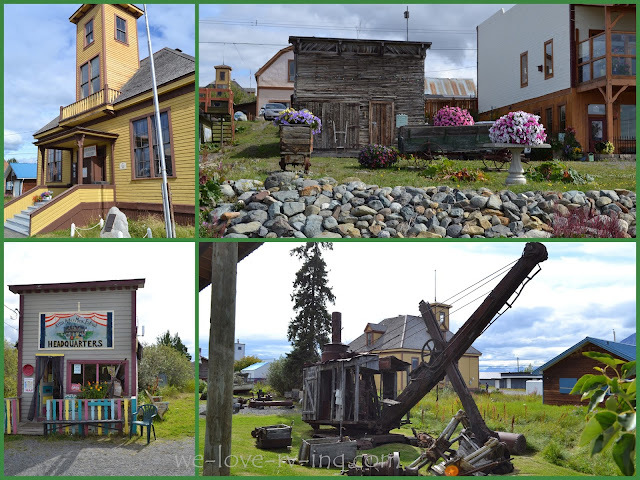 In the summer of 1899 Atlin was a busy mining town with a population around 10,000 people. It thrived for about 15 years until the gold rush was over. What a quiet quaint little town this is today with about 400 people enjoying this beautiful view of Atlin Lake. Being an unincorporated community, much of it is run by volunteers. There were several old buildings to see and old equipment on display at the museum making for an interesting walk around town. Many of the buildings are used as the old courthouse shows. They host an Atlin Arts and Music Festival every year. The fishing attracts fisherman to the area and the Atlin Lake, the largest natural, freshwater lake in BC. looks like a great place to explore. The Tarahne was a motor vessel that toured guests around Atlin Lake for twenty years. It was abandoned in 1937 after a short but successful time. The British Columbia Heritage Trust gave a grant to the Atlin Historical Society in 1985 and the Tarahne soon became the venue for many events held in Atlin. We considered staying out of town at a provincial park so took a drive out and came upon this view of the Llewellyn Glacier. Looking at this photograph, it appears to be of a painting but it is not, it is just as it was when I took this photo of the glacier. We decided to come back to town and chose to stay at the Norseman RV Park, which sits right on the Atlin Lake. We got to stay in the “penthouse” as the small spit was called and enjoyed our end-of-day visit in the sunshine. Our evening included watching the float plane take off from right out in front of our RV park, would have loved to have seen the views he would enjoy. The quiet lake on a quiet sunny evening as we sat around the fire made for a great finish to our day. Morning brings the rain. We have had lots of rainy times but having been driving most of that time, it really did nothing to spoil the adventures. We’ve had lots of sunshine, too. We made one more trip to Whitehorse for truck parts but would soon be heading home. Click here to follow our final days of the great northern adventure. Skagway, Alaska was our destination, mainly for the train ride of the White Pass-Yukon Route that we had heard wonderful things about. We’d booked in before our arrival and were ready for this amazing train ride. The one thing we did not want to see was a rainy overcast day. Our travels would take us through a high elevation and we’d hoped to see all the sights. Mother Nature may have had other plans as we travel through the Coast Mountains. We were booked into the morning ride and we will be taking that no matter what the weather does. There are other choices for trips through the White Pass but we chose to take the return trip from Skagway to White Pass Summit, which reaches an elevation of 2815’. Our 40 mile trip of just over 3 hours has a narration but we were happy to be able to buy a DVD of the same trip, one which would not be shrouded in fog as we were on our train ride. The fog was so thick that we could not see much of this trestle, but we were able to see it on the return. The railcars have a small ‘porch’ like area between them so I did spend some time out there to take photos. So small that we would take turns for photo opps, not room for more than two people out there. We have now reached the summit and are slowing down to make the return trip. There is no turnabout for the train. Once the train stops, we are instructed to get out of our seats and tip them so the back is now the new seat, which makes them face the other way. Genius! And we change sides of the aisle so we can see the other side of the valley. We sit while the train returning from the other route passes by us. This train has done the Bennett Scenic Journey, which covers from Skagway to Carcross, YT along the same route taken in 1898 by the Klondike stampeders. This also includes a visit to the Bennett Station, which is only accessible by train. Our travel back to Skagway gave us some better views with some of the clouds lifting. This trestle was part of the project that took tens of thousands of men and over 450 ton of explosives to build in very severe conditions. The train climbs almost 915 metres (3,000’) in 20 miles on this route and we pass through two tunnels. There are turns of 16 degrees and steep drops alongside the narrow rails. In 1901 they could claim that their steel cantilever bridge was the tallest of its kind in the world; the whole project was completed in 26 months by Canadian contractors. As disappointing as it was that we could not see all the sites due to the conditions, we do not have any regrets for taking the White Pass train ride. We did experience “the railway built of gold”. Moving on we shall soon be in BC. Skagway is a borough in southeast Alaska that sits at an elevation of 0 ft. in a narrow valley at the north end of the Lynn Canal. It is 145 km (90 miles) northwest of Alaska’s capital city Juneau, in the Alaska panhandle. Skagway has been called the Garden City since very early days. The long summer days allowed gardens to grow large vegetables and beautiful flowers, hence the name. The first competition for those beautiful gardens was held in 1902. Camp Skagway No. 1 was established as a brotherhood hall in 1899 when many men arrived by steamers for the Klondike Gold Rush. There would eventually be a total of thirty camps or brotherhood halls created with 10,000 members during that busy historic time. What makes this building look so unusual, there are almost 9,000 small pieces of driftwood on the façade. The many Gold Rush era buildings have been restored and preserved as part of the Klondike Gold Rush National Historical Park. Tourism supports this borough and there are several jewellery and gift shops to visit. The cruise ships travel up the Inside Passage and bring about 900,000 visitors a year to see the sights of Alaska that includes making a stop in Skagway. There were 4 cruise ships docked during our walk downtown but I wasn’t able to get one photo with all of them in it. The convenient location of where the cruise ships dock makes it very easy for the passengers to visit the shops. Although the streets look fairly quiet, there were thousands of visitors there. Tourism attracts about a million visitors a year, mainly during summer months, and the majority of these visitors come by one of the eight different cruise ship lines that visit Skagway. Among those thousands of cruise ship visitors, we did see a couple we recognized as teachers from our hometown of Kamloops, B.C. ; small world, isn’t it? The population of this borough of approximately 1,000 people estimated in 2015 explodes at the seams on any given summer day when the cruise ships stop in. This number doubles with seasonal workers when the tourist season happens but it would more than double that if only one ship stopped. When there are four of them…. can’t imagine how many tourists were in this town at the time of our visit. We did not take a tour with the Streetcar Tour on this 1927 bus but their tours sound great and well worth taking if the time allows. We didn’t plan for this and bookings are surely done far ahead of time with the busy traffic they get in Skagway. Our afternoon spent in Skagway included a walk around the town site to see what there was to see. A stop for a nice cold refreshing afternoon drink was at the Red Onion which included waiting in line on this busy day. The authentic looking saloon, just like it was in 1898, adds to the appeal which can also include a tour of the bordello museum upstairs. We passed on that, also. This site is where we will return to in the morning to go for a train ride through the great White Pass-Yukon Route. We had booked ahead of time and are hoping that our weather includes sunny skies once again. Click here to enjoy the White Pass-Yukon Train ride. We will cross two borders today. We have visited Carcross, Yukon and when we leave there will soon cross the imaginary border into the northwest corner of British Columbia. We will then later cross a real border, with crossing guards that check our passports to go into Alaska to get to Skagway, AK. The borderlines are very convoluted in this corner of the country but just follow the road and you won’t get lost. Low clouds are the camera and my biggest obstacles of the day. We are not getting too many raindrops on the window now but these beautiful mountains are well hidden behind the clouds overhead as we travel down the South Klondike Highway. The Yukon Suspension Bridge, located in British Columbia, was built in 2006 which makes it fairly new in this land of so much history. It spans the Tutshi River Canyon and gives access to hiking trails on the other side. I am not one to like walking across suspension bridges, my experience at Capilano in Vancouver proves it is even harder coming back, so this was the closest we got to it. The landscape was very different from what we’d been seeing. The rock formation had the look of another planet, or at least a place we’ve never been. The farther we got on this road, the more fog we were in, crossing into Alaska in the dense fog. We crossed the border into Alaska at Fraser, the fog cleared and soon after we got ourselves parked we set out to do some exploring in the area. This view of Skagway was taken from the viewpoint on the road that took us up to the famous Chilkoot Trail. The Port town for Dyea was a few miles out of town on the Taiya River. The Tlingit people established Dyea as an access point to the interior. The fishing village was on the transportation corridor to the Taiya Inlet and canoes were the only mode of transportation to other villages in the Inlet. Before the Klondike Gold Rush happened, the Chilkoot Trail was an overland way to get supplies to interior villages. The 53 km (33 mi) walking trail from Dyea, AK to Bennett, BC. reaches heights of 1,074 m (3524 ft) over the Coast Mountains. We did not climb the Chilkoot Trail. We may not have even seen the actual trail as we were not planning on hiking so weren’t about to investigate further. So much growth in the area, we couldn’t see the Trail for the trees. We followed some signs but there was nothing left to see of Dyea other than the signs on the paths we followed. Hard to believe but Dyea grew when the Gold Rush happened and once had a population of 5,000 to 8,000 people at its peak. When the gold rush ended and new access was developed, the population was down to 3 people in 1903. This route was travelled by over 21,000 gold-rush stampeders, as those fortune seekers looking for gold were called, when the great news of the Gold Rush became known. The trail included the Golden Staircase which was 1500 steps carved from ice and climbed 184 m (600 ft) in just over one kilometer (.6 mile). The challenge of the Chilkoot Trail was so difficult, it is hard to believe that so many stampeders were able to make that climb, with all the supplies they needed to take with them. Many of them did not make it. Click here to read more of their journey, it is fascinating. We are on the road again having left Whitehorse and heading south on Highway 2. The day was overcast with showers so the scenery was not the best for photos but the clouds lifted as the day wore on and we did enjoy some sunshine. We passed by Emerald Lake, “Jewel of the Yukon” that has several pretty shades of blue green water. The color is created by sunlight reflecting off “mare” which is white calcium clay that forms then settles at the bottom of the lake. Isn’t nature grand? Our first stop of the day was the small community of Carcross, current population of 450. It was originally called Caribou Crossing but due to confusion with the same names being used elsewhere, the name was changed in 1902 to a shorter version of that name. An RCMP post and settlement was formed during the gold rush days and Carcross was a major boat building center at one time. Tourism is their biggest draw now, as the Yukon has a lot of great wilderness for hiking and biking adventures. There were not a lot of tourists visiting on this rainy day. We didn’t go into the town but walked around in Carcross Commons area for our stop. The totem poles and artwork that decorates the shops are the best attraction, in my opinion; I enjoy the First Nation art. 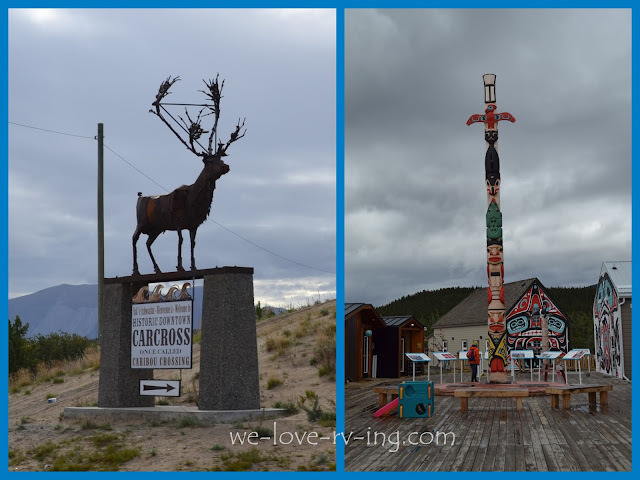 Carcross is the traditional territory of the Carcross/Tagish First Nation and they have reclaimed their language, traditions and their culture, which came close to disappearing over the years. Six Clans now exist here to carry on the traditions of their elders. These are of the Tlingit and Tagish, each with their own distinctive history and represented by the mural facades here. Their history and way of life of the Carcross Tagish First Nation people are a unique blend of them both. Keith Wolfe Smarch and his son Aaron Grey Wolfe Smarch are considered the “carvers of Carcross”. This very talented team have done some beautiful work displayed in Carcross. This is an interesting interview, click here to watch them and see their work. The White Pass and Yukon Route’s Canadian terminus is here and today there are thousands of tourists who have enjoyed the incredible scenery on the trip to Skagway and back each summer. The Duchess, here now for display only, was purchased in 1900 to run as the Taku Tram on the 4 km (2 mi) connection between the Tagish and Atlin Lakes. The sternwheeler SS Tutshi was built in 1917 to originally accommodate the tourists and then used as a carrier for mail and freight to other communities and mines. The construction of roads changed the need for that and it was no longer being used in 1955. It was going through a restoration when a fire destroyed most of it in 1990. One would never expect to see a desert in this countryside, but there it was. The dunes of the Carcross Desert are not technically in a real desert due to the humidity but was fun to see. The one square mile of desert is considered the “world’s smallest desert”. We had a short driving day today with 128 km (79 mi) ahead of us but with making one stop to enjoy a view plus the slow driving that the Dempster Highway demands, we arrived to Inuvik just after lunchtime. Inuvik is Canada’s northern most town and has a population of 3500 people. It is the homeland to Inuvialuit, Gwich’in and Metis peoples but has become home to many non-Aboriginal, as well. Inuvik offers 56 days of continuous daylight during these summer months. Inuvik, which means “place of people” was first conceived in 1953 and became official in 1958. It sits on the banks of the Mackenzie River and amid the ecosystem of the Mackenzie Delta which is made up of hundreds of lakes and channels that flow north into the Arctic Ocean. We made our reservation at Happy Valley Park before we’d left on our Northern Adventure and would stay for 3 nights. We got some grocery shopping done, and the prices were a bit shocking, to say the least! But then again, we were 500 miles up the Dempster Highway so higher prices were expected. Then we had some time to relax and enjoy the nice sunny day in Inuvik. The first thing we would do when we arrived in Inuvik would be some cleaning after that dusty drive as well as some laundry at their facilities in the park. We did some shopping and some wandering around town but our visit timing had been planned for the Great Northern Arts Festival. The Great Northern Arts Festival has been held annually since 1989 and is the largest annual tourist event in this vast Delta. The majority of these incredible artists were from Canada’s north. We were there for the opening ceremonies and I sure was wishing I had a video camera for the drums and dance. It was totally enjoyable and the highlight of my visit, for sure! The Festival was held in the Inuvik Family Centre, which is a great recreational facility and part of the Midnight Sun Recreation Complex. This large inuksut sits outside the Mackenzie Hotel in Inuvik. It means “something which acts or performs the function of a person” and was the symbol used for navigation, camps or anything wishing to be noted. It has become a Canadian national symbol for many different places and events. The Inuksut, pronounces ‘inukshut’ was used in the logo for the 2010 Winter Olympics, and became a very popular souvenir for many. Something we'd not seen elsewhere is Inuvik’s utilidors. These are above ground utility conduits for water and sewage. The lines are covered by corregated steel and connect most buildings in town. They are necessary because of the permafrost conditions, which would prevent underground lines. 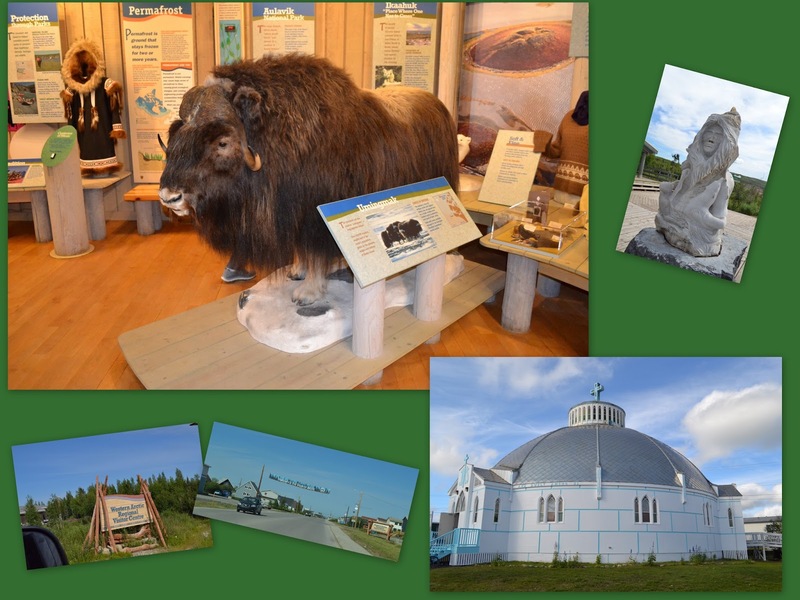 The Visitor Center had some great displays, one of the muskox which was not something we were able to see in the wild on our travels. The Our Lady of Victory Church, often referred to as the Igloo Church was an interesting sight to see and a big attraction in Inuvik. We visited the Town Hall where we were given a free souvenir pin. We also received this certificate which verifies our travels up the Dempster Highway and another which gives us an Exclusive Lifetime Membership in the Order of Arctic Adventurers! 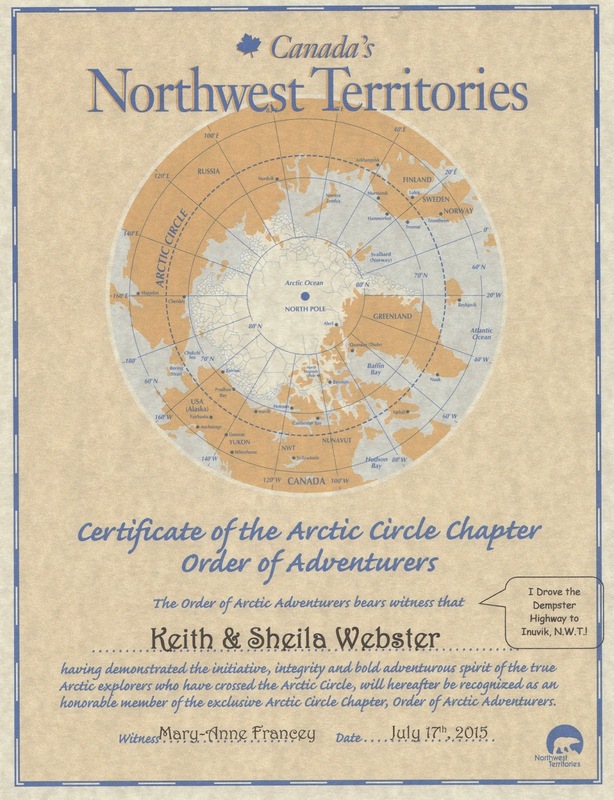 We drove a long way for this certificate, lol.